The long awaited Fans Forum finally arrived and the question must be was it all worth while. The answer to that has got to be yes and no, so I'll sit on the fence and just try and report on what was said but only if I can remember most of it from the sketchy notes that I jotted down. It started off with the expected two of Harriers Chairman, Barry Norgrove and the Team Manager, Mark Yates. They were flanked on either side by Neil Savery and Wayne Allen with Chris Onions in charge of the ageing microphones. There was a bit of publicity for a fund raising venture from within the club and then cheques were presented to Mr Norgrove from both KHIST and the 250 Club totalling �1,250. The honour of the first question fell to Dr Martin Lewis who asked whether season ticket reminders would be sent out this season and if we had a list of the names of previous purchasers that could be used. Barry simply said "yes" and that moves were already being made to set this in motion. Dr Lewis also asked when would a supporters representative be allowed onto the board and Barry answered again saying that it was the norm for most Conference clubs to have a supporter on the board and that York City were one club that do this. Mr Norgrove should really have said that York City are owned by the supporters and all board members are also Trust members. Roy Davies spoke next about a statement from Nuneaton Borough recently that stated that their proposed playing budget of �400,000 would not be enough to allow them to survive in the Conference National if they got promoted this season. His question was that if major investment was not forthcoming in the near future would our board be prepared to see the Harriers being relegated next season. Barry answered by saying that many other clubs had much lower budgets than that and they all seemed to manage. Roy also asked the question that if we had been in sight of a play-off place would we have let Iyseden Christie and Mark Jackson go to Rochdale. The Chairman answered in the negative and said that financial reasons meant that we had to allow them to leave in order to rebuild the side to the standard that the manager wanted. Guy Fergusons question about Stuart Watkiss was next as he asked if the offer of his meeting the fans to talk about where the club were heading, and why, had led directly to his dismissal a few days later. Mr Norgrove denied this and said that the reason Watkiss was sacked was because we were in a run of bad results and the time had come to bring in a new manager. He said that Watkiss knew this and was using a call for a fans forum as a way of making excuses for his own lack of results. Simon Guest said that this seasons influx of players with little or no charisma was leading to a reduction in people attending games. Fans want to come to be entertained but without the likes of Christie here now then the excitement factor was causing fans to leave in droves. Mark Yates answered this one by saying that we still have exciting players at the club in Simon Russell, Jonny Harkness and Michael Blackwood. As Nemesis would have said: Hmmmnnn! Simon Burgess asked if Mark Yates had been given a contract yet and Barry said that he had, or soon would be, given one until the end of next season. 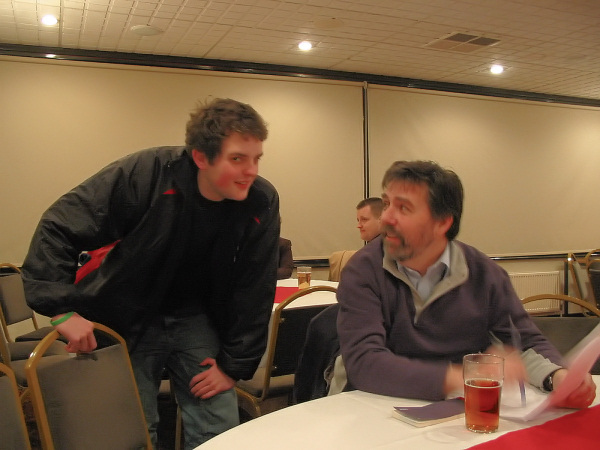 Burge also asked Mark if he rated both of the Harriers keepers, John Danby and Danny Lewis. Mark said of course he did but he's always on the lookout for someone that could be better and that bought in the next question nicely which was about the scouting done on possible new players. Mark answered again saying that he has a network of scouts, probably at Burnley, Cheltenham and Graham Allner, that worked well and he also takes in many scouting trips himself. Stuart Berrington asked about the Youth Team set up and what Yates' thoughts were about it. Mark said that the future of it was still being considered. Stuart also asked about the state of the pitch and what was to be done about it. Barry answered this one and said that we would be getting Hewitts, a company that are doing the Wembley pitch?? ?, to come in and advise us on it. The question was asked by someone not a million miles from this keyboard that if we did have a new pitch would we also employ a groundsman to maintain it. Mark Yates said that we had got a groundsman and he was doing a very good job working on it seven days a week. He asked me who did I think it was - I thought it was a trick question and thought twice about answering so didn't. Here's me thinking it was Roger Barlow when all along his name is Eric. It was all very amiable so far but then came the next question from Gerard O'Shaugnessy. Does the board feel that we are charging too much to see the Harriers perform badly at �16 a time when we could go to Villa Park or St Andrews and see Premiership football. Would we attract more fans if we reduced our admission charges. Mr Norgrove said that it was because of the superb efforts of Baldwin that we were in such a financially secure state now and this was all done free of charge. We had replaced the previous accountant, on a salary of �35,000 pa with one that was doing the job for nothing and that Baldwin also brings with him a wealth of knowledge in football accountancy. The same questioner also asked why we used an accountant from Cannock when there were many accountants as Harriers fans and they had never been asked. BN replied that he thought John was the best and his own accountant had met Mr Baldwin and he then quoted the immortal phrase that 'John Baldwin is something different'. This is not the place to discuss Baldwins previous history or his creativity and I don't intend to get this website closed down either. 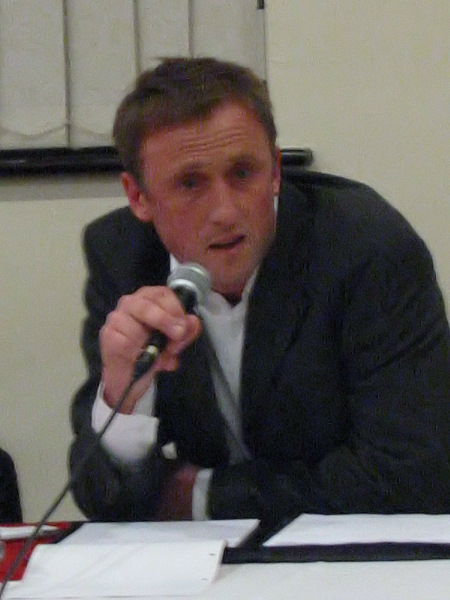 The long awaited Dave Berrington (aka Nemesis etc) took the floor next and immediately led a tirade into why the board had sacked Gary Barnett as the previous assistant manager, citing financial reasons, but had allowed Mark Yates to bring in Neil Howarth as his right hand man. Mark Yates said that was nothing to do with him, Neil was his friend and he was doing a good job even though Mr Berrington thought otherwise. Dave also asked why the squad was being trimmed to the bone and why was the Youth Team being given a slow death to which Mr Yates said that when he took over the job that the squad of twenty six was far too big and he wanted to work with a squad of around eighteen. Ways of keeping the Youth Team were being looked at. It all got a bit personal then when Mark made an aside that Dave was even sending his daughter to spy on him in his local pub, the White Hart in Hartlebury. Dave rightfully said that his daughter lived in Hartlebury and worked at the pub and that was just a coincidence and nothing to do with him. Phil Baker asked whether Lionel Newtons shares would revert back to him if new investment in the club was not forthcoming but all Barry said was that information was confidential and the matter was not for discussion. We took a short break then and so will I. Part 2 here.